Given the wide selection of options in our Dried Bulk Chilies section, we thought it would be a good to list each chili in terms of its heat level and flavor to help you decide between them. The Scoville heat scale (developed in 1912) is the oldest and most commonly referenced method of measuring pepper heat. The testing method is actually pretty simple: a panel of five or more judges is subjected to a taste test featuring the paste form of each pepper that has been diluted with sugar syrup. The degree of dilution required for the judges not to detect any capsaicin in the mixture determines each pepper’s rating on the scale. Despite its inherent subjectivity, this scale is still a useful way of ranking peppers relative to other peppers. Capsaicin is the naturally occurring molecule in chili peppers (likely evolved to deter mammals from eating them) that causes a burning sensation when it comes into contact with any tissue. Recent biological studies have demonstrated that it also actually activates heat receptors in the human mouth (just as menthol activates cold receptors). 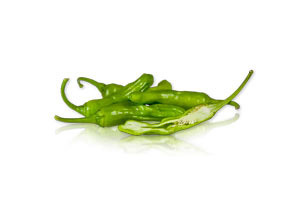 One of the easiest ways to tone down a chile pepper is by removing the seeds and inner ribs. This will significantly decrease the total capsaicin level of the pepper. Here is a link to the Gather article about your chili and ghost peppers. We had a lot of fun talking about your peppers. I’m afraid at this time we only have access to dried aji amarillo peppers. Sorry! In small food processer add 1/2 cup soy sauce and peppers. Blend till liquid. pour into glass bowl. Slice beef into 1/4″ strips. mix all ingredents together add beef. Marinaite over night in refer and dehydrate. A dehydrator is best. whats dihes can i cook with the typ cillie. You’ll find all of our chile recipes here —> Chile Recipe Collection. As to which recipes work for which chiles, most chiles can be used in all chile recipes, it just depends on how hot you want the finished dish to be! Do you ever have either Urfa or Aleppo peppers in stock? These are both out of the middle east and a bit hard to find, both have excellent characteristics of heat, flavor and a bit of smokiness. While we don’t currently carry them on the site, we may be able to special order crushed Aleppo peppers for you in bulk. Send us an e-mail (info (at) marxfoods (dot) com) or give us a call (866-588-6279) if you’d like a custom quote! We’re not sure when the fresh ghost chilies will be back in stock, but if you’d like we’d be happy to notify you when we have them again. Unfortunately we can’t predict at this time what the price is going to be when they return. Every other place has ghost peppers as topping out at one million scoville units. Why are yours rated so much lower? Ghost chilies, like all chilies, can vary in heat level from chile to chile and from origin to origin. How & where they are grown can make a huge difference. That million scoville units you see elsewhere online is, in our opinion, better described as “up to 1 million scoville units”. It’s not our impression that it’s based on the actual chilies being sold, but instead the highest test results known being applied to the variety as representative of all ghost chilies. In our case, the number you see on this chart was provided by the company importing the chilies for us, and is the result of them actually testing their chilies. While there will be variance even within our supply, we felt it was better to err on the side of being accurate rather than sensational. Congrats on entitling your article using the correctly spelled word “chile”. I was pleasantly surprised – so many web publishers get it wrong. Alas, I am dismayed to see that, when writing the word chile in the plural form, you have incorrectly added the letter “i” (resulting in “chilies”). The correct plural is “chiles”. I know. You’ll go to other sources on the web (or even in print), written by Gringos, and find “chilies”. But they have it wrong. Look at Mexican and other Latin American cookbooks and you’ll see “chiles”. It is a responsibility of publishers dealing with cultural subjects, like cuisine, to spell words properly rather than perpetuate incorrect spellings. Bravo for including this comment on your page. You are clearly a publisher with integrity. How is the “hotness” of peppers determined or measured? I’ve answered your question as a separate post on our AskMarxFoods blog here. I hope it helps! You have a nice chile Heat Scale. However it is a little out of date and the chiles at the top are quite hotter than what you state. Thanks for commenting and providing all that great info! Our chile scale is actually based on the scoville testing for the chilies we offer. In some cases at the very top of the scale the specific chilies we carry have tested at a level that is lower than the “ideal”. Rather than set up false expectations, we’ve used the numbers we’ve been provided to ensure the scale is as accurate to our products as possible.